This contemporary counter height dining set is an interesting and functional contemporary option for your home. The table features four wide, flat rectangular legs, a sizable top, extendable to 78 inches, a deep brown finish and a cracked glass insert as an accent. 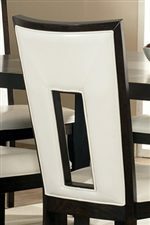 The included six bar chairs feature a two tone look with a deep brown wood finish and a white seat and back upholstery, with a chair back cutout, and sleek curved chair tops. Create a gorgeous, eye catching dining room gathering space in your home with this unique and fresh pub table set. The Delano 7-Piece Contemporary Counter Height Table & Side Chair Set by Steve Silver at Walker's Furniture in the Spokane, Kennewick, Tri-Cities, Wenatchee, Coeur D’Alene, Yakima, Walla Walla, Umatilla, Moses Lake area. Product availability may vary. Contact us for the most current availability on this product. Case Detail Wide flat legs and clean geometric edges. Description: Top Tops feature cracked glass table inserts. The Delano collection is a great option if you are looking for Contemporary furniture in the Spokane, Kennewick, Tri-Cities, Wenatchee, Coeur D’Alene, Yakima, Walla Walla, Umatilla, Moses Lake area. Browse other items in the Delano collection from Walker's Furniture in the Spokane, Kennewick, Tri-Cities, Wenatchee, Coeur D’Alene, Yakima, Walla Walla, Umatilla, Moses Lake area.